Get the annual rainfall amount in millimeters or centimeters for a given region. 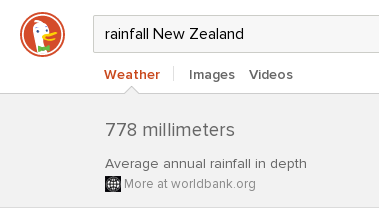 Some Wikipedia entries for places have annual rainfall. The WoldBank offers a Climate Data API which contains the Precipitation (rainfall and assumed water equivalent), in millimeters. Please let me know if there's any issues as this is my first attempt at a DDG Spice. Anyway, maybe there's another API that can offer similar functionality. Awesome! Glad to see you're working on it. Feel free to make a pull request once its ready and we'll be sure to give you some feedback. Regardign the API's data I did not realize the data was provided for ranges of years. After a quick check I found this other API: http://www.ncdc.noaa.gov/cdo-web/webserv... -- I'm not sure if it's usable though, the docs seem a little hard to understand. I'm not sure if it provides Global data or if its just focused on the US. Sadly the ncdc.noaa.gov API is US only. This provides the most recent data (2012) which is updated every 5 years. The parts I'd like feedback/brainstorming on are a list of acceptable triggers and the content template. Glad to hear you figured out that API! It sounds like you're far enough along to make a Pull Request on GitHub. It'll be a littler easier to discuss the trigger, design etc on GitHub. Even if the IA isn't 100% complete it's no problem, just be sure to mention what feedback you're looking for in the Pull Request comment and myself or someone else from the team/community will be able to help you out. This instant answer is live!